I have used more sprinkles in the past few weeks than I have over the course of my entire life. First, it was Molly Yeh’s funfetti cake, which my best friend and I decided to add extra sprinkles to, and then I unicorned it for my cousin’s sixth birthday. (Side note: The amount of effort it takes to make a unicorn horn that doesn’t look like a wiener is actually impressive, but I don’t think I did too bad for my first time?). The next notable encounter with sprinkles involved these pancakes. Back in the good old days of SSL, I made a ‘birthday cake pancakes’ recipe with ‘homemade cake batter’. As an avid anti-cake batter proponent, I was dead set on making the birthday cake pancakes that were floating around Pinterest but without boxed cake mix; at the time, this was downright impossible to find on the internet, and I went through a whole process of making homemade ‘cake batter’ that involved a food processor and a freezer. 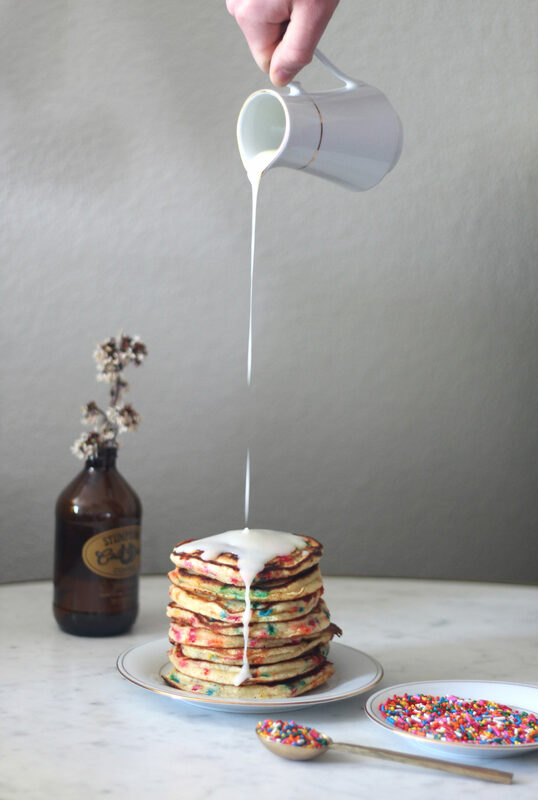 Overall, way too much time for Sunday-morning pancakes, and while they tasted like cake, it still wasn’t the perfect funfetti flavor that I was looking for. 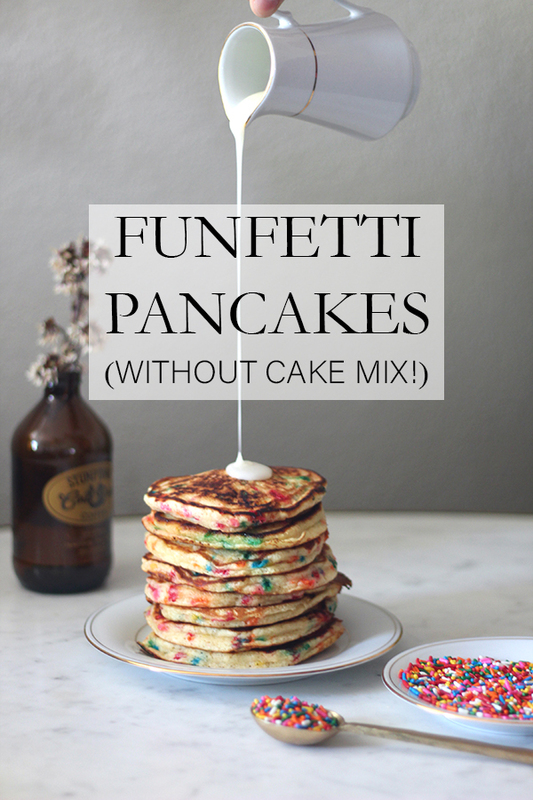 I’m not sure if the ‘birthday cake pancakes’ trend is still relevant anymore, but as far as I’m concerned, anyone who doesn’t support sprinkle-y, rainbow-y breakfast foods is just a force of negativity nobody needs in their lives 🤷 That’s why I recently decided to revisit the funfetti pancake trend sans cake mix using some recently discovered knowledge! It all started when I read Bon Appetit’s feature on Momofuku Milk Bar’s Birthday Cake. The main takeaway was that the key secret ingredient to any homemade funfetti cake is artificial vanilla flavoring!!! At first, I kind of freaked out, because I am a die-hard member of #TeamRealVanilla, but I thought about it and thought about it, and it totally makes sense. 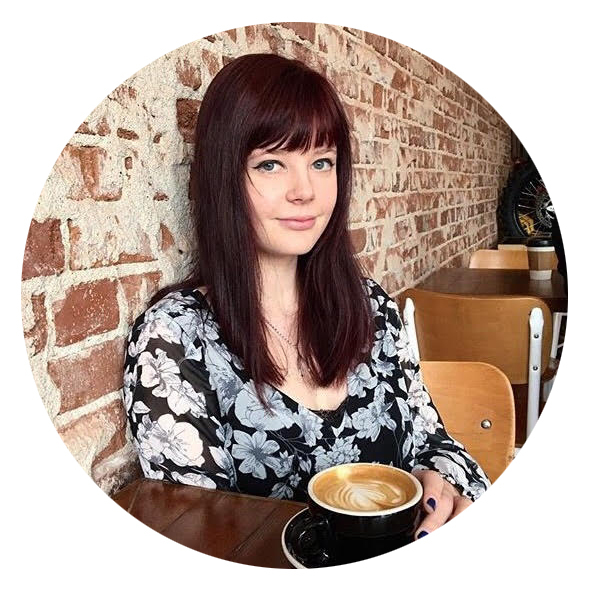 After I read Molly Yeh’s funfetti recipe, I was downright convinced. 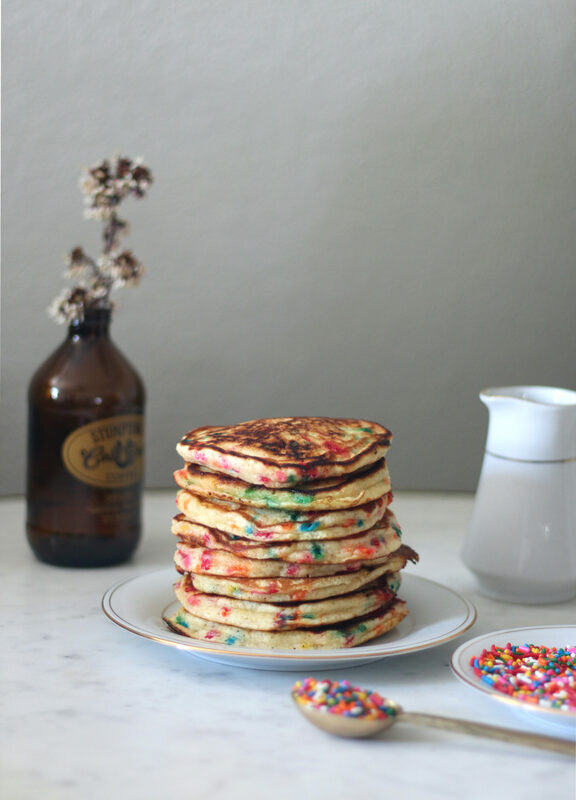 I looked over my original funfetti pancakes recipe, and realized that the ‘homemade cake batter’ step was 100% unnecessary; you don’t need ‘cake batter’, you just need artificial vanilla flavoring + sprinkles. Duhhhhhhhh. With this knowledge fresh in my mind, I decided to take my favorite pancake recipe (that I’ve never actually posted here, sorry world) and add artificial vanilla flavoring and my favorite rainbow sprinkles. These can be found in most baking or ice cream sections of the grocery store – they are colorful and pretty and include absolutely no chocolate sprinkles which is of upmost importance to me. However, if all you can find is the kind with chocolate sprinkles, I will forgive you and move on with my life. What resulted from all of these experiments was a fluffy, buttery pancake that brought me back to childhood birthday parties, except in this scenario, I’m an adult who gets to eat cake-flavored treats for breakfast whenever I feel like it!!! 6 years of funfetti pancake research was 100% worth it. This recipe has the flavor of funfetti without using boxed cake mix. The most important thing to remember with this recipe is to not overmix the batter, or the pancakes will come out flat and dense. They are served with a buttery glaze rather than syrup, although I'm sure syrup or whipped cream + berries would be delicious as well! In a small bowl, combine the flour, sugar, baking powder, baking soda, and salt. In a medium bowl, whisk together the buttermilk, egg, melted butter, and imitation vanilla. Add the flour mixture to the buttermilk mixture, and mix until just combined. Don't overmix! Add the rainbow sprinkles. Let the batter sit for 10-15 minutes. It will get bubbly - do not mix it after this point. Those bubbles will make the pancakes fluffy. Heat a pan over medium heat. Melt some butter in the pan, and add about 1/4 c. of batter to the pan, tilting the pan to make a circle. Cook until lightly browned, flip, and cook for another minute or so until the pancake is cooked through. Repeat with remaining batter. Keep warm in a low-temp oven. While the pancakes cook, combine the powdered sugar, butter, artificial vanilla, and milk to make a glaze. Start with 1 Tbs. of milk and add another to thin if necessary. 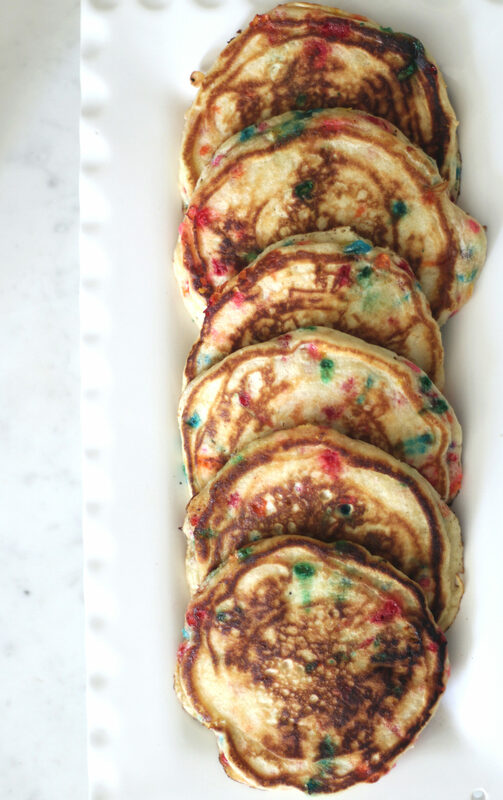 Serve pancakes with glaze and additional sprinkles over the top! I agree I’m a die-hard true vanilla peep and I applaud your 6year quest! You always make me hungry! Lol! Thanks so much Nims! I totally understand that, I will research a recipe until it’s absolutely perfect!